Those wonderful folk Simon Gibson and Michael Mahan, of International Yacht Collection, offer the ideal way to end this week, with an open house invitation aboard Horizon's 39.6m superyacht After You on Friday, October 16th. Located at Bimini Boatyard and taking place between 4pm and 7pm, you're invited, after viewing this superyacht, to head over to Bimini for drinks, food and music, all on IYC. Here's a little more on After You: Built in 2008 to DNV class and MCA compliant, she sleeps 12 guests in six staterooms plus eight crew in four cabins. 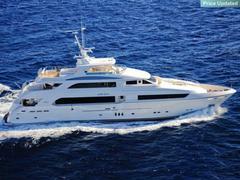 Offered with new boat warranties in place, she's asking $14.8 million.